Is it better than the Safari default browser? People in Hell might well be staring at the floor wondering if it's looking a little icy following the news that Opera Mini has been allowed through the Apple vetting process for iPhone and is offering the first true competitor to the default Safari browser. Opera made a fairly typical big song and dance about submitting its app, and to collective gasps of shock, the browser has been allowed through the Apple approval process and is available for free right now. 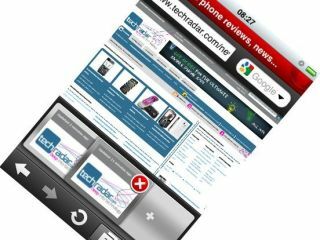 TechRadar has had a little time with the new Opera Mini for iPhone, and the early signs are that it is significantly faster. Loading the TechRadar home page on the Safari browser takes approximately 18.5 seconds, but on Opera it loads the text (without the piccies) in 7 seconds and the entire page in 16. Some of the headline additions are worth mentioning; Safari for iPhone's clunky multiple page option has been bemoaned by many, but Opera offers a more elegant and speedier solution. The capacity to flick between multiple pages and quickly close ones that you don't need is certainly useful, and although not quite tabbed browsing it's a nice system. There is an upper limit of five pages set by the browser, and it seems to handle flicking between this many relatively well. One of Opera's other major features is the speed dial, aped by Google's Chrome, which offers multiple favourite pages as your home page. Adding to this page couldn't be simpler, with plus signs on empty spots which you tap to fill with bookmarks, history or by typing in the page you want. Getting rid of the defaults (or erroneous additions) is slightly clumsier, but once you've worked out how long you need to hold before letting go of the icon you'll soon be setting things up as you want. There was some criticism of Opera Mini not having pinch to zoom when it was shown off at Mobile World Congress, but it is in place in the final release. However, it is the double tap system that works best for zooming in and out of pages, and the chances are that pinching will not be your primary mechanism for getting to where you want to go on a given page. But it is the pace that will attract people to Opera Mini; over 3G and Edge you can really notice the speed difference as the Turbo boost kicks in and gets the information you need quickly. Opera's case for getting Opera Mini for iPhone through the vetting process was that it happily co-existed alongside Safari because it doesn't render HTML but a customary binary representation of the website, and that Safari still dealt better with rich and content heavy websites. But make no mistake, the early indications are that is a browser that may well lure people away from the default – offering a faster, friskier and far more satisfying browsing experience.